Femi Falana is one of the respected voices in the legal profession and also the father of hip hop artiste, Folarin Falana aka Falz TheBahdGuy. In this interview with TOFARATI IGE and BUKOLA BAKARE, he talks about the legal profession, his son’s career, family life and other interests. Over the years, you have been consistent in championing the rights of the masses. In all of these, have you had any fears for your personal safety and that of your family? No, because life is so cheap in our country. Whether you are involved in human rights struggle or not, you could just be mauled down on the highway or you could be kidnapped or robbed, so there is no basis for entertaining fear once you believe that your cause is just and right. I keep on doing what I know how to do best with a view to taking people out of problems, going to the police station to bail people detained illegally, going to court to ensure that those who are unjustly treated get legal reprieve. You are a prominent lawyer who is passionate about human rights, what is the place of the rule of law in Nigeria at the moment? There is a formal recognition of the rule of law in Nigeria. It is entrenched in the constitution and the federal, state and all governments in Nigeria are required to comply with the rule of law. Unfortunately, in practise, the contrary is the case. There are scores of court orders that are being disobeyed and disregarded by the government. Some of the notorious ones include the orders of court nullifying the illegal detention of Sheikh Ibrahim Yaquoub El-Zakzaky and his wife; the orders of court admitting Colonel Sambo Dasuki (retd.) to bail; the judgement of the court, one of ECOWAS court and one of the federal high court that every Nigerian child should be given free education up to junior secondary school level. There is also a court order that the Peoples Bank be restored to assist the poor by giving them loans and an education bank be set up to assist indigent students in our institutions of higher learning. Another one says that the Federal Government must account for all the funds that have been recovered between 1999 and now, there are so many other court orders, I can go on and on which are being disregarded by the government. Are there any particular incidents that made you take that decision to represent those who won’t ordinarily have access to the law and was it a conscious one? As an undergraduate, I was involved in student unionism whereby we had to take on some of our colleagues and attend to their problems. By the time I got into legal practice and became a lawyer, I chose the type of practice that I wanted to engage in. I believe that the rich are sufficiently taken care of and adequately represented and for ideological and political reasons, I decided to identify with the poor in the society so it was a deliberate decision. 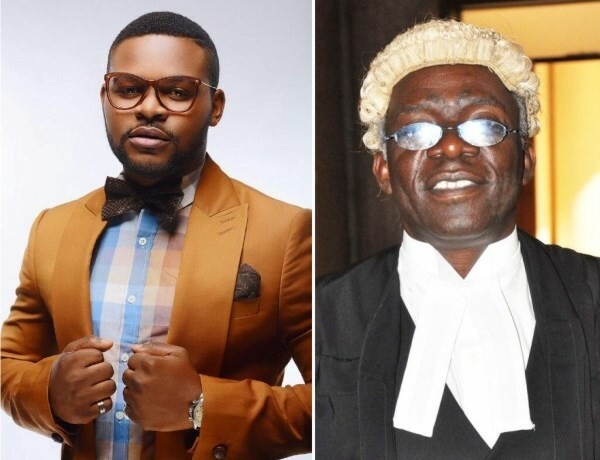 Your son, Folarin aka FalzTheBahdGuy, also trained as a lawyer but he is now a full-time music artiste. What was your reaction when he informed you of his decision to become a musician? The decision to become a musician was entirely his and we try not to impose our views on our children. Our belief is that you need to guide them, give them education, train them to be critically independent and take their decisions because when parents insist and decide to choose careers for their children, it is not always very helpful and it is not the best. Therefore, based on my liberal disposition, I didn’t feel disturbed or worried when he walked up to me one day to say, ‘‘ Dad, I’ve had enough of legal practice.’’ I just said, ‘It’s barely two years, what do you mean?’’ He told me that he was going to follow his own passion-full-time and without any hesitation, I simply wished him success. I was convinced then as I am now that I could not be held liable if he failed. The society would have recognised that I gave him the best education. My wife was however worried which again is natural and told me to try and persuade him otherwise because this guy did very well in university in the United Kingdom, excelled in law school and then he was already trying to become a good lawyer. So, why didn’t you discourage him? My attitude was to say, let’s give his option a trial, if he doesn’t succeed, he would come back, so let’s encourage him. We had a lot of discussions on it and at the end of the day, my wife became persuaded and said let us give his choice a trial. I think he is doing well for himself, so we have no regrets for our decision. Folarin is quite versatile. He plays good football and is the captain of our chambers’ football team. he led our team to win the 2016 and 2017 Lawyers Football League Championship. At what point did you notice that he had a flair for entertainment? In primary school, he was a member of the school band and I think when he was in secondary school, he also had begun to be playful but we tried to get him to concentrate on his studies. We have three kids-two girls and Folarin, but he was the most reserved. He could be in the house for three days and just be in his room, so I was therefore pleasantly surprised when in the university, he said that he was going to contest elections and he subsequently became the Vice- President of the Afro-Caribbean students at the University of Reading in the United Kingdom. That was when I began to notice that he was coming up to be relevant in the society. In fact, he had to address his colleagues one day and was able to combat stage fright and by the time he said he was going into music, I knew that he was okay at that point. When he released his first single, did you listen to the song and what were your thoughts? I listen to all his songs and initially, we had a debate over them and it took him time to be persuaded that he had to sing about social issues in the society. At that time, he was just trying to say, ‘‘Dad, the young people simply want to entertain themselves and I don’t want to waste my time on politics.’’ But I think now, he has seen the need to be relevant, so his songs now reflect that and have enough social content. Which of his songs are your favourites? I like Wehdone Sir, Soldier and quite a number of them. He is now talking about the problems of the society through his songs. As someone who represented the legendary Fela Anikulapo-Kuti during his lifetime and your son is also into conscious-oriented music, do you sometimes get the feeling of a pleasant déjà vu? He said, ‘‘No, mum, I don’t want anybody’s name to open doors for me. I want to open my own door. The day I would be happy is not when they ask me are you Femi Falana’s son? I want them to ask both of you sometime, ‘‘Are you Falz’s parents?’’ and I think he has gotten to that stage. What do you call him at home and is there a distinction between his personality as Folarin and Falz? I call him Folarin in the house and none of us call him Falz. Folarin and Falz are essentially one and the same. Maybe initially, there was a difference but now, they are one and the same. Another child of yours is tilting towards media and entertainment, how does that make you feel? Our last daughter has a master’s degree in TV Journalism. Again, that was her choice and had nothing to do with me. My first daughter is a lawyer though. The other two have chosen their paths and I won’t lose sleep over the choice of any child. My own father wasn’t a lawyer, so why should I insist that my son or daughter should be one? Are there specific things that you wish Falz would address with his music? I am not sure that would be for public consumption. All I can say is that we discuss regularly and I make suggestions but as I did say earlier, I would like him to be more relevant in his songs with the problems confronting the society-poverty, unemployment, preventable diseases, growing illiteracy among others so that he can also give members of the ruling class some sleepless nights to compel them to address the problems plaguing the country. Have you ever attended any of his concerts? I attend on his invitation. He once invited his mum and I when he made a public presentation of one of his records. Then, last time we watched his concert, we were invited by the organisers of the programme. How often are you recognised in public as Falz’s father? There are very positive comments about him and I do hope that he would continue to remain humble and committed to his work and then, he also has to be more hard-working to remain relevant. Of course, people have asked me, including friends, ‘‘Why did you allow him to go into music?’’ but there are also people in the industry who commend us for ‘donating’ our son to the entertainment industry so I would think that there have been positive reactions generally on the part of people but again, luckily, there are many people who do not believe that he is my son and that is good for the both of us. Most entertainers these days run into hitches with management companies in terms of copyright law because they don’t go through their contracts well, what kind of advice would you offer in that regard? It is not a new phenomenon-most of our artistes have been pauperised by lack of due diligence with respect to agreements and contracts signed by them. Unfortunately, the government has not been helpful in combating piracy and that has pushed many of our artistes to the fringe of poverty. In the case of Folarin, I think his knowledge of the law has largely assisted him and I think he has only referred just a couple of contracts to us and sought advice but generally, he has been able to take care of his contracts and he hasn’t breached any agreement. What is your favourite form of entertainment and how do you like to relax? I listen to music, read a lot and I also write. I travel very regularly in and out of the country and I am also busy attending to problems 24 hours of the day. I get calls from in and outside the country from victims of human rights’violation. I get calls from prisons- inmates who want their matters taken to court and I also get harassed by the media to respond to one form of human rights violation or the other. What are your favourite genres of music? I love reggae, afro-beat and of course, Folarin is now forcing me to embrace hip hop music. Regularly, your office is filled with people who besiege the place with one issue or the other, yet you are so energetic with no signs of slowing down, how do you find the energy to still continue this way? I have able colleagues who assist me. For instance, my wife runs the home and the office and that affords me the opportunity to get involved in a number of extra-curricular activities. Can you recall how you met your wife? What legacies would you want to bequeath to humanity? That would not be my business because once I am gone, that’s it. I just want to make my contribution to the progress of my society and ensure that I leave my country better than I met it.